Opinion: Democratic Party and Uganda People’s Congress turns more and more into NRM-Lite! “Power is a curious thing. Who lives, Who dies. Power resides where men believe it resides. It is a trick, A shadow on the wall.” ― Lord Varys (Game of Thrones). “Adjective: Denoting a low-fat or low-sugar version of a manufactured food or drink product” (…) “Origin: 1950s: a commercial respelling of light, light” (Oxford Dictionary – Lite). This here isn’t something based on evidence, but more a genuine feeling I have is not only one I share, but many others. There is something at stake and someone who has agreed the negotiations so these so-called opposition parties isn’t really so. That is why the Uganda People Congress has some MPs in the Cabinet and the same with Democratic Party. The same can be said that both of these parties, still have slots or parts of the delegations to the East African Legislative Assembly (EALA) in Arusha. What we do know is that James Akena, the newly concurred leader of UPC could easily do some trade-off with NRM in 2015. That isn’t just mere speculation as his party did decent and there haven’t been any controversy or lashing out from NRM MPs towards the UPC in ages. Secondly, the DP has become the good DPs and the ones that even are parts of NRM Celebrations. There is something up with these two parties, just like Uganda Federal Alliance and Beti Kamya all of a sudden is a bigger support of the NRM government than the former NRM historical’s and the NRM hardliners. The President and his NRM CEC must see their State House visits as a blessed and ease ways of figuring out how to undress the opposition and how to deal with them. All needs a meal-ticket, the question is who will give in to the regime and at what cost. Therefore, the arrangement and the deals behind the close doors show the conning way of the illegitimate regime who uses all sorts of methods to undermine the opposition. 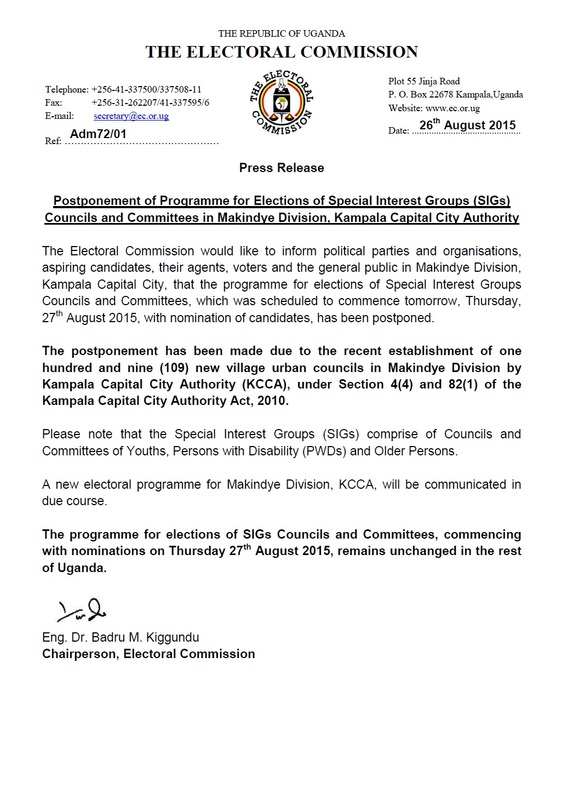 The FDC has clearly given in too, in my book, with even becoming the shadow-government in Parliament. Something the FDC NEC shouldn’t have considered and agreed upon, because when NRM together with the President agreed to get a UPC minister and DP minister, it would be hard to have shadow-government with members from these parties. That would be rare and weird to explain. We can even wonder if Norbert Mao even cared of losing his slot as Member of Parliament in the 10th Parliament, as the DP was behind Amama Mbabazi Presidential Candidate through the The Democratic Alliance (TDA). Why I say that now? Since he is snickering and defending the NRM on NBSFrontline, attacking Lord Mayor Lukwago and the FDC when he can, just as we would expect Akena, since he has been bought sometime during the 2015. The price and the value of the UPC is for him and his closest allies to know. DP’s Mao on the other hand is worrying, that Fred Mukasa Mbidde went so easily and elected into the EALA, also how little care the DP has given to the DP Cabinet Member Florence Nakiwala. Who could have thought the party would trade these folks that easily? That without any worry and without care has let it go, that they have set the standard of being a mediocre party who has no courage and no fighting spirit. Maybe, Mao has gotten tired of fighting as the campaign he himself has a Presidential Candidate was sour, it wasn’t a joyful journey as the promises and the ride against the police force wasn’t ideal. Therefore, the battle even for his own MPs place got lost and as a leader who isn’t in Parliament, while the ones in Parliament are getting cosy with the NRM. That might be why Mao is complied with the forged friendships and trading in Parliament, to make sure they can gain the most. Still, the value and integrity of DP is dwindling, with every forged agreement with NRM makes them more and more alike, less different. The NRM regime and NRM caucus in Parliament is adding DP and UPC, they are just turning into branches of the regime instead of being rooted on their own and on their own framework. It is just like Mao and Akena, just shift-bosses instead of being their own factory leaders. They work less for their own product and delivery, more and more to please the Executive through agreements and negotiations. That is why the NRM has swallowed their paths and the lacking spine of DP and UPC has given way for this. Therefore, the current affairs and state makes them like a light version of the NRM. For this reason DP = NRM Lite and UPC = NRM Lite. Both parties are old and have a long history; they were established long before NRM, still the abolishment from Obote, made the other obsolete. So Museveni’s trick of being in the shadows of these parties before and after the parties, this is essentially killing of the multi-party system. That the NRM are tarnishing the DP and UPC to becoming NRM knocks-offs. All of this is mere speculation, but still, there aren’t any official agreements in public between UPC and DP towards to the NRM, but their friendliness and co-operations are evident of certain negotiated deals. You will not hear Akena or the UPC complain about the NRM, just like Mao suddenly defends on national TV their position towards NRM and attacks Lukwago. There is just some uncertainty of how and what they have done behind closed doors. Beyond a shadow of a doubt some worrying signs that can and should be questioned, especially not accept as the acceptance of these parties to the NRM gives way to establish deep concerns of the value of opposition at all in Uganda. Since the DP and UPC have been thresholds for such, now it is FDC, even with a FDC NEC who doesn’t concern their legitimising the Parliament. We all should ask and question the recent efforts from DP and UPC as legitimate opposition, even as parties without connections or how possibly they have accepted agreements with Movement. This surpass the judgement and the recognition of their existence, it is more the mere fact of lacking attention to transparency and accountability, as they are giving way to a regime who certainly does not care about procedures or acts or rule of law. The parties are therefore giving the Movement acceptance and are silently supporting their rule with these sorts of acts. Certainly, something the founders of these parties would turn in their graves and wanted to resurrect to adjust the malfunctions of these parties. Peace. Well, 20-17 just starts and with a bang, the former honourable Norbert Mao of the Democratic Party doesn’t care anymore about nepotism and autocratic regime, which if President Museveni gives away executive power to his wife Janet or Maj. Gen. Muhoozi that it doesn’t matter! “The Democratic Party President Norbert Mao says Ugandans are so desperate for change that they no longer care to whom President Museveni hands over power peacefully. According to Mr Mao, just like many Ugandans especially those born after Museveni captured power in 1986; he does not care whether the president hands over peacefully to his son Muhoozi Keinerugaba or wife Janet Kataha Museveni” (Daily Monitor, 2017). Well, it is understatement that I am confused about the peaceful transition it seems to be only that the business stays in the family. If Mao thinks that the Mafia, the elitism and the gravy eating regime going to drastically change with the wife or son of Museveni, he is sadly wrong. That is by the mere fact of the history in other countries where family members take-over as in Equatorial Guinea, Cuba, Syria and North Korea isn’t actually splendid evidence of totalitarian regimes handing over or coup d’état from family members to become the Executives. That Norbert Mao wants to give way for another unelected family member to the throne is a mere demonstration of the meagre effort of opposition to the Movement. That he accepts the draconian and all eating Museveni and let his family go forward before the Republic. It’s an insult to all Ugandans. That only the Clan of Museveni is fit to rule the Republic. There we’re a Republic before Museveni and be one after his time. Still, now it seems that Mao is so tired and has so little faith in the Ugandan people, that he gives way to the Museveni clan. He should care as he should be voice for the ones really wanting change and a peaceful change from the government and regime that only cares about Museveni. So Mao shouldn’t lose faith. Mao should fight with fellow comrades and want a substantial change for the Republic, that doesn’t owe anything to the Museveni clan. Peace. No matter who get appointed or picked as long as the His Excellency President Yoweri Kaguta Museveni is in charge and the Commander in Chief. So as long as he is there, his decrees and orders will matter. So the results and the final say are in the hands of the President. He will not care what the locals of Karamoja votes or the ones in Mbarara, what matters is what is needed for the Movement and in the end him! The Electoral Commission under the Dr. Badru Kiggundu has been a useful tool for the regime. He has used all kind of ways to get the results that we’re needed. Also all kind of explanation to avoid the reasoning or even trying to shuffle the defence as the relevant laws to sustain the needed excuse to exhaust the courts. This has been done as the Opposition has questioned the legality and the just behaviour of the Electoral Commission. The all of sudden 100% in counties, the ghost voters, the unregistered voters showing up and the moving of place of voting for the citizens, the lack of delivery of ballots and equipment to key areas. This has been tactics as well as fixing the elections into the schedule of the Movement. Free and fair was never important for the President as long as his loyal men and woman we’re plated and sent to Parliament. Or his loyal men and woman elected through the Resistance Councils and the Local Government positions as Local Councillors and such. This will not change as the appropriate men and woman is not in circle of the new Electoral Commission. The cleared name from the President is more loyal men and woman who want to eat of the Presidents hand. They want to eat and are hungry like the rest of the MPs who has cars and no income tax. The same level is what the EC commissioner’s wants and therefore wants to be hired. So they can live in mansions and have government perks that citizens don’t get. So no matter who is put up in the Movement and who they want to appoint will be working for the President and his elite. The regime will not change their pattern even if Badru Kiggundu is out of the picture. Will just be a new face that will eat the same level of crap. The reality is that the names put forward now by the President is his loyal cadres, they are not bi-partisan or even becoming of people who the citizens can trust. That is for the same reason as the ones before, they will be the loyalists for the pay-check of the President; they will not be there for people. They are just useful props for the President to get his fake-elections and votes when needed, but not something he cares deeply about. If he did he would have set in place systems where the people wasn’t starving and had water-irrigation to secure the harvest even in dry season. He has 30 years, but hasn’t left much behind because what he has is fragmented and eaten by his ego. Therefore the EC will be marked of his loyalist, not of the ones who is best for nation, but who is the best for the “only man with a vision”. Peace. Our esteemed partners, members of the press, it is my privilege and pleasure to welcome you to this press briefing. Today, the Electoral Commission would like to update the country on the commencement of the campaign period for Local Government Councils Elections, preparations for nomination of Candidates for Parliamentary Elections, as well as other activities related to the Roadmap for the 2015-2016 General Elections. Candidates for Municipal Division, Town Council and Sub County Chairpersons, Directly-elected Councilors; Councilors representing Women, the Youth, Persons with Disabilities (PWDs) and Older Persons. Campaigns for the above elections commenced after the harmonization of the candidates’ programmes, for each respective category yesterday, Tuesday November 24, 2015, and will stop forty eight hours before polling day for each category. The Electoral Commission urges all candidates, their agents, supporters, and members of the general public to adhere to set rules and regulations guiding the campaign period, and to particularly ensure that campaigns are held in accordance with the harmonised campaign programme. Candidates and/or their agents must not use or publish any foul language or defamatory words, which incite public disorder, hatred, violence or which threatens war. The nomination of candidates for Parliamentary Elections will be conducted on 2nd – 3rd December 2015. Member of Parliament for Persons with Disability (PWD). The nomination of candidates for Directly Elected Member of Parliament (representing constituency) and District Woman Member of Parliament, shall take place at the respective EC District offices across the whole Country beginning at 9.00 a.m. and ending at 5:00pm on each of the appointed dates. Please note that the nomination of Members of Parliament representing Persons with Disability (PWDs) will be held at the Electoral Commission headquarters during the above period. The National Conference for elections of Members of Parliament representing Persons with Disability (PWDs) will be held from 21st to 22nd February 2016, at a venue to be communicated by the Commission in due course. The Electoral Commission calls upon the Uganda Police Force to ensure law and order during this period. Please note that the Electoral Commission will not organize nomination for representatives of the following Special Interest Groups to Parliament, during the above period until Parliament of Uganda addresses the concerns raised by the Constitutional Court. Please note that a candidate who uses a convoy for purposes of nomination shall have a maximum of two vehicles bearing police stickers and each shall carry a maximum of ten persons. The Electoral Commission would like to commend the Presidential candidates for the smooth start to the campaigns, and especially compliance with the harmonised campaign programme. We urge the candidates to continue in this direction, so that together, we achieve a peaceful campaign and elections. However, the Commission has also noted with concern, the consistent calls by Candidate Kizza Besigye, one of the Presidential candidates, for defiance as a campaign strategy. This kind of campaign is likely to have serious impact on the conduct of peaceful campaigns and elections. The Commission condemns this kind of conduct and hereby warns the Presidential Candidate, his agents and supporters, to desist from taking this path, but instead conduct the campaign in accordance with the law. The Electoral Commission has also noted several reports of malicious acts of defacement and/or removal of candidates’ posters. The Commission warns the general public, candidates, their agents and supporters, that a person who malicious defaces or removes or tears any election poster of any nominated candidate commits an offence and is liable on conviction to imprisonment. We, therefore, caution the public, and our stakeholders to stop using unauthorized name and logo when referring to the Electoral Commission. Similarly, the Commission took note of the article published in The Sunday Monitor (November 15th 2015) where the Chairperson Electoral Commission is said to have stated that the Electoral Commission will announce the right winner, because the Electoral Commission of 2016 is different from the Electoral Commission of 2006. This has created an impression that the Commission did not announce the right winner in 2006, which is very wrong. I wish to state that the statement attributed to me was not correct. The Commission has always announced the winning candidate at each elective level; this has always been the case in all elections we have organized, and it will be the case in 2016. Finaly, the Electoral Commission joins with all Ugandans to welcome His Holiness Pope Francis to Uganda. We congratulate the people of Uganda on this unique opportunity to host the Pontiff a third time. This should serve as a reminder to all Ugandans of the special position our country holds in the world. The visit takes place at a time when political campaigns are taking place by candidates contesting for various elective positions. Let us use the visit to promote the virtues of unity and peaceful co-existence. An FDC Leadership Conference in Jinja: Ends with the Calvary causing havoc!